3D Touch is now available for Deputy on iOS, giving you quick and easy ways to perform basic tasks right from the home screen. You will be able to start your shift right away from the 3D Touch menu. When you select this option, the Deputy app will open. It will then retrieve your location (for timesheet and time-theft purposes) and start your shift. Tapping the ‘End Shift’ button will immediately end your shift. Select this to start your break. 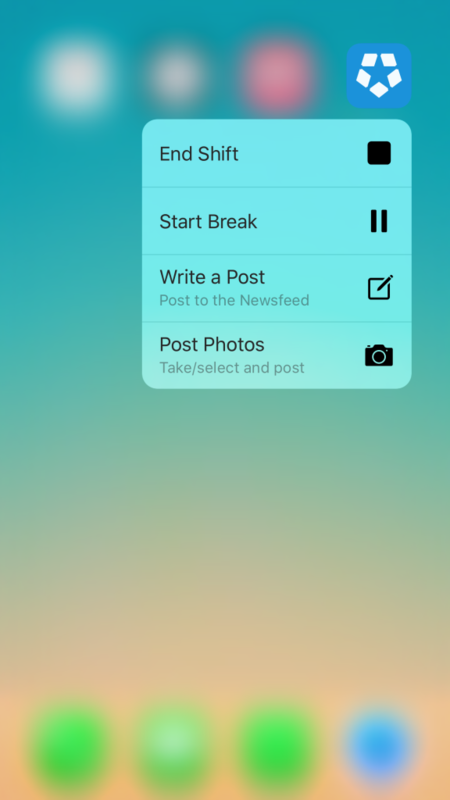 To end your break, simply select ‘End Break’ in the 3D Touch menu. The ‘End Break’ option will only appear if you have previously selected ‘Start Break’ in the same shift. This will bring you to the News Feed tab, where you can create a News Feed post. Simply select the location you want to post to, type your message and press ‘Post’ in the top right hand corner. You can select this option if you want to include a photo in your News Feed post. This will open up your Gallery. You can either select an existing photo in your phone's photo gallery, or you can click the camera icon to take a photo. Much like posting a News Feed post, you must then select a location and insert text into the post. When you are finished, tap ‘Post’ in the top right hand corner and you’re done!